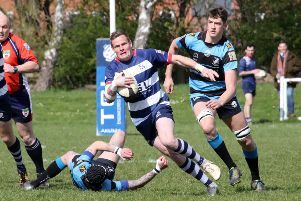 Shipston-on-Stour travel to joint leaders Pinley for Saturday’s Midlands Three West South top-of-the-table clash in excellent form. The Rams extended their unbeaten run to 13 games on Saturday as they beat Old Yardleians 46-12 at Mayo Road. The visitors arrived at Mayo Road looking to fight their way our of the relegation scrap that they are involved in. They fought back strongly from going a try down from wing Matt Daniells early on. Belying their lowly league position and playing some good rugby, especially in the opening 20 minutes, Old Yardleians made it hard work for the Rams as they were camped in their own 22. The Shipston defence held firm though and, after holding off the Old Yardleians onslaught for the first quarter, began to open the game up and never really looked in any trouble from there on. They spun the ball wide and with real pace at times and Old Yardleians struggled to live with their intensity. The Rams scored four tries and secured the bonus point before halftime, going in at the break with a 22-5 advantage. After a slight lapse in concentration from the restart, in which Shipston allowed Old Yardleians to gather from a knock-on and waltz under the posts to score, they tightened up. The midfield of Tom Corby and Harry Jackson was dominant and there was some intelligent kicking and running lines from full-back Tobi Faulkner and wingers Daniells and Sam Cooper. The forwards were too strong and mobile for the visitors’ pack and they moved them around the park, making it difficult for them to compete at the breakdowns. Ben Summers had a solid game at tight head and the back row of Aaron Neal, Alex Hammond and George Wilcock were lively all afternoon.